With thanks Quercus for the galley copy of this novel! As always, my reviews are non-bias and fair. A hot new high school comedy for redheads and all who love them. Top student. Beauty queen. Girlfriend of the hottest football jock. Felicity's got everything. And it's all down to her red, red hair. Felicity lives in Scarletville, the world's only redhead sanctuary, where red hair is celebrated, protected – and the key to success. But Felicity has a secret. A red hot secret. And if anyone finds out, she's finished. Because Felicity's actually a natural blonde. And in Scarletville, blondes need not apply. I knew the moment I saw Red on Goodreads before it's release that I would have to read it someday in the future. And now that time has come! I saw it on Netgalley and jumped at the chance. I was so happy when the lovely people at Quercus accepted my request! I had read reviews that it was a fun, high-school contemporary novel, and ones like that are loved in my collection. I have Red Hair. Totally not natural, but I was obsessed for so long to get ruby locks. I naturally have very dark brown hair, so it was a work in progress. Now my hair is golden red in the sunlight and brown in the dim light, so I have the best of both worlds. So ultimately, I get why Felicity wanted to fit in with the other redheads in Scarletville. There's something about fitting in, in addition, that makes life easier for a little while. But the message would be to embrace who we are naturally, than who we want to fit in with, and I think that the journey of Red was a roller-coaster of many amazing, enchanting things. I read Red in one sitting, compulsively page after page just absorbing the hilarious one-liners, the parts in the city of the Redhead Sanctuary where the plot really made me think--and that's a very rare thing an author can do for a reader; make them contemplate those situations in their own lives and play them over in our heads--so I was really into the fantasy that something like this story-world could exist and was playful, but easily believable. Felicity was trying to play into the hand of the society, not wanting her regular dye-jobs threatened, so that she could fit in and not be a strawbie--which to us, in the real world, is a redhead--so you get the idea that there is a false conception that Felicity should fit in, but because she only knows what she grew up in, in that environment, she doesn't know that the town's obsession with being a true red is as important in the real world. The characters were brilliantly executed and I truly enjoyed reading about all those that played part in Red. Felicity was of course my favourite, but you can't beat the humor between all the characters in Red. I was constantly laughing to myself and that's one of the things that is a must have for me. The ability to make me laugh, smile, think...a true reading experience. 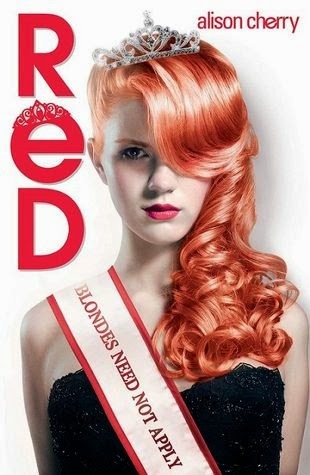 Overall, Red was an amazing read and I can't wait to see what is next from Alison Cherry. I believe she has a new novel coming out soon called For Real which looks to be living up to the high standard of Red in it's popularity on Goodreads and other blogs. So I'm looking forward to reading that in the future, too! I haven't read this one yet. To be frank, the plot line didn't interest me as much, but I can see why it would - you. I think I have this book though, and I'm a fan of funny, quirky one-liners. I last dyed mine in November, so it's kind of in between a nice auburn and brown, which I'm happy with at the moment! But I'm always changing my hair, ha ha.